PRRO Water is a sustainable water management initiative of PFP Industries. PRRO Stands for PFP Technology, RecyClean Services, Roughneck Equipment and OptiBlend Industries. PRRO also means the professional grade water that can be reused for specific applications. Water, a basis for life is also considered a liquid gold. The importance of environmental stewardship while developing a sustainable business model from the natural resources is a must when it comes to corporate responsibility. As the name PFP suggests, “Products For People”, PFP Industries products, services and business vision is motivated by environmental stewardship, scientific, efficient and cost-effective solutions to increase the overall bottom line. PFP industries is the synergistic mix of companies that serves the Exploration and Production (E&P) operators and service companies focused on the upstream and midstream sections of the oil and gas industry. Drilling, Completion, Production and Flow Assurance are the four major components of upstream and midstream processes. 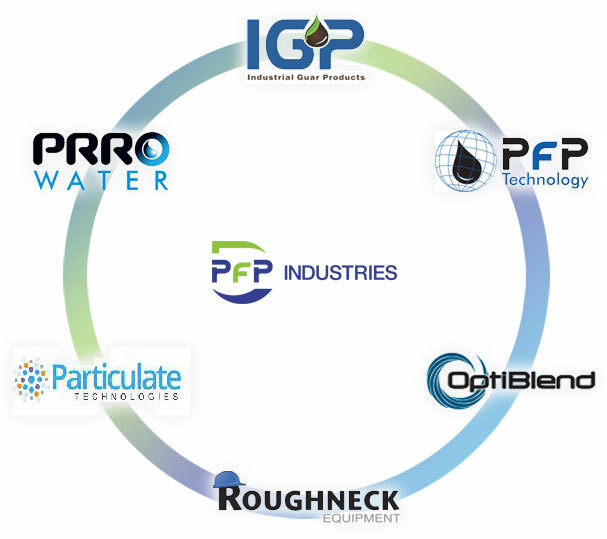 PFP Industries serves all of these four components by providing chemical services, water management services, customized equipment, mud-related services, custom and toll blending, and logistics.